Komprey (Comfrey) – Scientific name: Symphytum officinale L.
An ancient herb known since 400 B.C., used by the Greeks to treat bronchial problems, wound healing and mending of broken bones. The healing constituent is allantoin. Ingredients may be steeped or dissolved in hot water; boiling should be avoided as this may cause the breakdown of allantoin. Caution: Since the late 70’s, subject of persisting concerns and debate on certain alkaloid contents that may cause liver damage. Advice is given against use of comfrey as salad green or tea. Confirmed source of vitamin B12, although in negligible amounts that would require consumption of 4 pounds of comfrey daily for minimum daily requirement. Decoction of leaves used for a variety of illnesses: Asthma, cough, ulcers, constipation, hypertension. 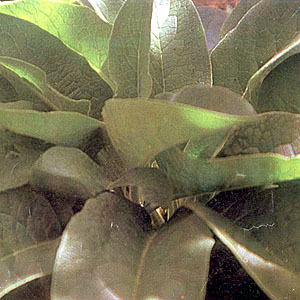 Poultice of fresh leaves used for sprains, inflammatory swelling, external wounds, sores, athlete’s foot, burns, insect bites, and abscesses. Juice of leaves used for a variety of skin ailments and wounds healing; apply three times daily. Decoction of tea as a sleep-aid. This entry was posted in List of Medicinal Plants in the Philippines and tagged comfrey, komprey on March 12, 2009 by Pinoy Herbs. can I ask where this plant is abundant here in the philippines? where can i find Komprey root here in the Philippines?? Ritchie, this is Myrle Peters from Cebu. I am interested in Comfrey. May I ask where your garden is located? Do you sell those? Hi I’m in Cebu do u know where I can get this plant?